There are a few things on your Bongo, that you may not have realised were there. Drain Hole – Located under the bonnet, on the bulkhead. This will need prodding with a stick, quite frequently, so that water is free to drain away. I leave a handy stick lying at the far left side of the area shown. 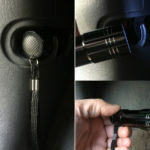 (It also doubles as an expansion tank dip stick, to check coolant level if it’s not easy to see). Extra Seating – Ian Maynard (Bongo Fury) explains the extra seating you can create in your Bongo. 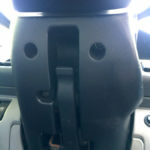 (Those little flappy footrest-looking things behind the front seats). Flare – Bongos left the factory with a bright orangey-red coloured distress flare, housed in a bracket just under the glovebox on the left side of the passenger well. Most people remove this and instead, place a small torch in the bracket. 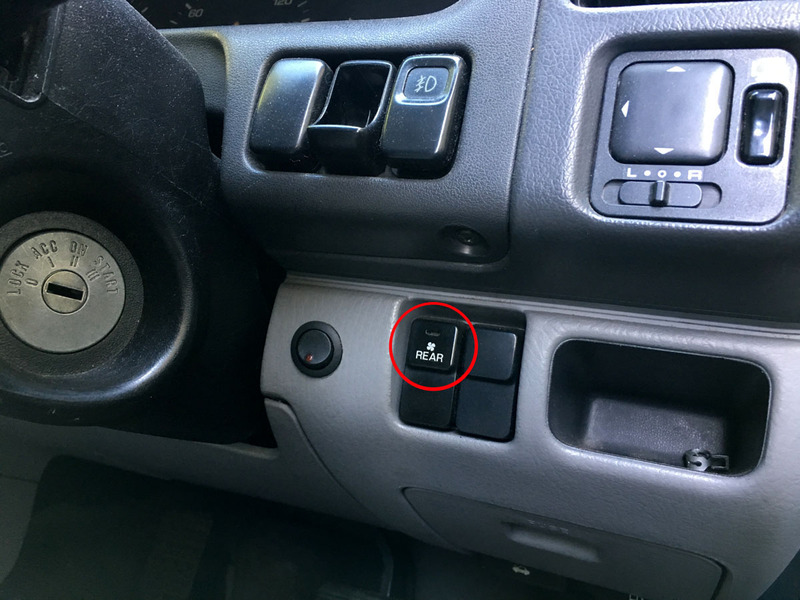 Rear heater fan – For the rear heater fan to work, you have to also switch on the rear fan switch, just below and to the right of the steering column. You also have to have the front fan on, at least at its first position. 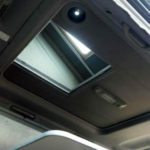 Roof hatch and main panel – Surprisingly, some people don’t realise that the whole of the ceiling can be raised – not only the little access hatch. 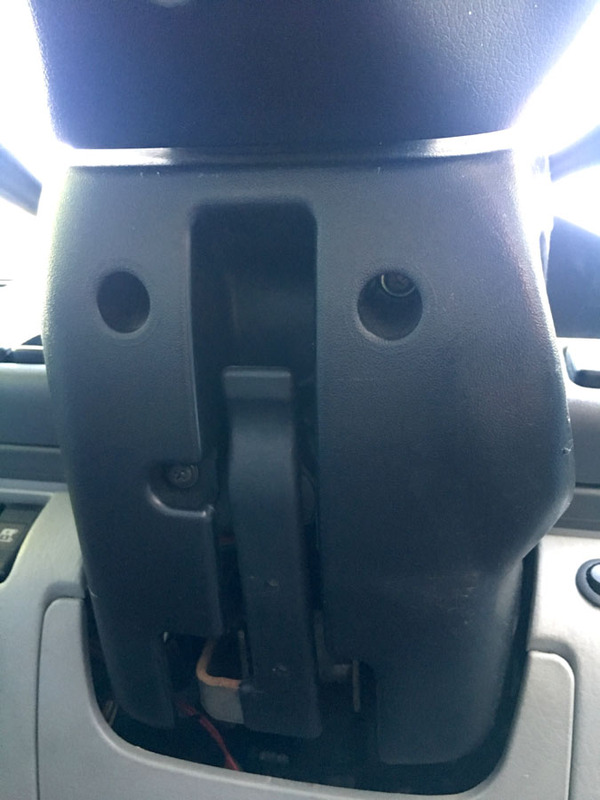 This gives the interior quite a bit of standing space. 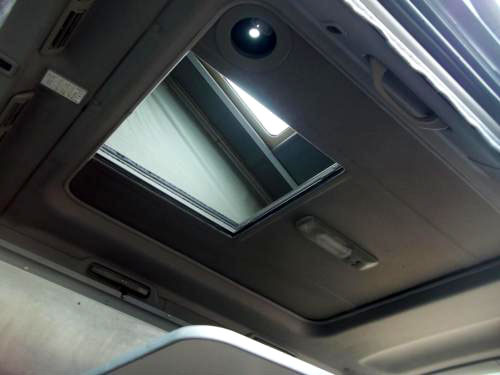 Also, if you first open the little hatch and then push the big panel upwards (it holds up on gas struts) you can access the sliding cover that blocks the skylight, thus bringing in lots of extra daylight to the whole van. 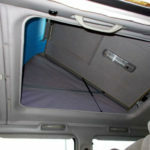 Simply pull the panel down, to restore the ceiling. Single wipe of windscreen – Push the wiper stick away from you, to activate a single wipe. Spare wheel access – The spare wheel lowers from below the Bongo, on a cable. Open your side door and open the little plastic door on the step (see Tool Kit storage lower down this page). Look for a long metal rod and a ratchet handle. 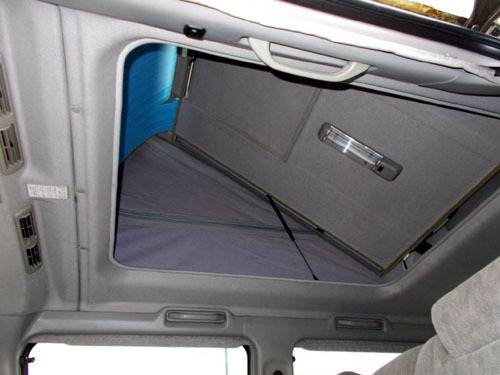 Insert the rod into the rear of the van, add the handle and turn to lower or raise the spare wheel. (A space saving wheel is usually fitted, but many owners swap this for a full size spare wheel, which still fits perfectly). 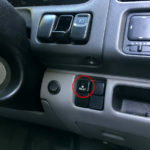 Steering column adjustment – On most Bongos, you can adjust the angle position of the steering wheel by releasing a locking bar, under the steering column, and then re-locking it. (For the sake of safety, this should be done when stationary). Tool Kit storage – on the side of the step, behind the sliding door. 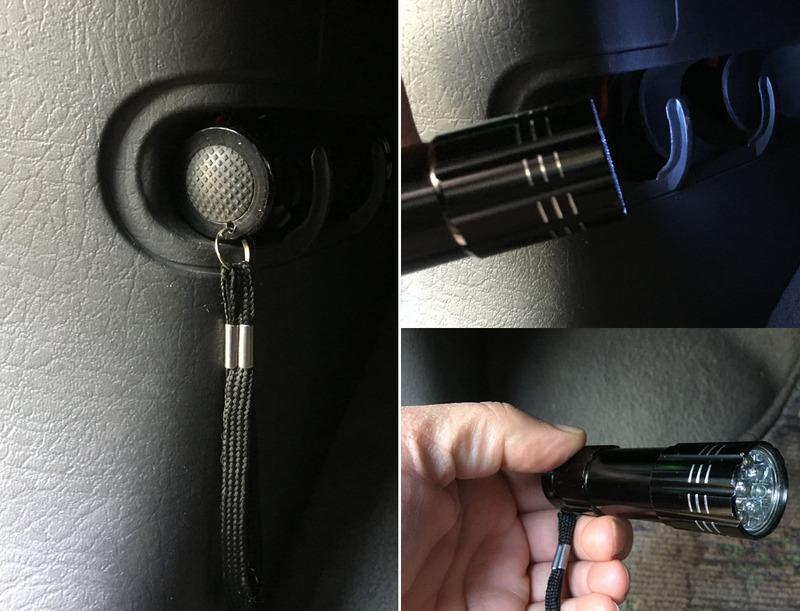 This normally contains a scissor jack, long rod for the spare wheel, and a handle that attaches to the rod. Here’s a useful tip, provided by Stuart Coates. If you have digital controls and switch on the rear heater with the ‘rear button’, it switches it on. If you then hold that rear button down, you can control rear mode and fan speed from the front. Heat setting still needs to be done at the rear panel though. When pressed and held, the display flashes to indicate it’s the rear you are controlling. When finished, press to return to front, or leave, and it will change back by itself. If after a while, your alarm starts to sound for no good reason, it may be because one of the sensor screws has become coated with a thin film. This acts as an insulator and the alarm circuitry doesn’t get a resistance connection through the water. Removing the screw (or screws) and giving them a good clean with a wire brush (or similar) restores the contact surface and the alarm once again, works as normal.